Check out our Pest Library! There's nothing worse than an uninvited guest, especially when that guest is a pest. If you're facing pest problems, give us a call for reliable pest control you can count on. From ants and spiders to scorpions and rodents, we do it all! Proudly serving the areas of Tyler, Bullard, Jacksonville, Palestine, Athens, Lindale and the surrounding areas, our goal has always been to provide you with exceptional service for all of your pest control needs. Our friendly technicians are fully licensed, so you'll always know you're in good hands. Call Lane Pest Control for prompt, professional pest control service, today! Introducing Lane's Pro Green Dry Carpet Cleaning. Offering Dry Organic Carpet Cleaning and more. Lane Pest Control offers pest control services for residential and commercial properties. 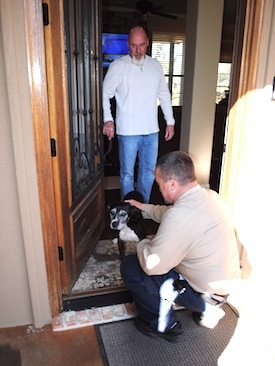 Our friendly technicians are licensed, insured and trained to handle any pest problem. We offer affordable rates on all services, so you can keep your home or office pest-free without spending a fortune. We provide treatments for your entire home or business. Every treatment includes an inspection and treatment inside and out. Keep the mosquitoes out of your backyard party! Start monthly treatments and enjoy your yard again. We offer the Sentricon® Termite Colony Elimination System as well as pre-treatments, conventional termite treatments and WDI inspections. Certified bedbug professionals. Learn more about bedbugs at Bedbug Central. Our fire ant service is safe for your family and comes with a one year warranty. For peace of mind we offer complete pest control packages designed to meet everyones pest control needs. Our Premier Package is a Quarterly Inside and Outside Pest Control service that covers and controls over 14 insects/pest including Roaches, Ants, Spiders ,Earwigs, Scorpions, Crickets, Mice, Rats and Carpenter Ants and many more. Comes with a 365 day warranty on our treatments. Our Premier Deluxe Package is the Perfect if you want extra coverage like Mosquito Treatments so you can enjoy your back yard year round without the worry of Mosquitos. Plus this plan comes with our Termite Warranty Plan as well to give you protection from termites. Up to 1/2 acre lawn. Our Ultimate Package is perfect if you want total home protection and peace of mind. Includes everything in our other Packages, plus Fire Ant and Flea Control. Plus this plan comes with our Termite Warranty Plan as well to give you protection from termites. Where customer service is our #1 priority.